We continue to view decreasing P/E coupled with increasing prices as a very positive sign for the value of world markets in general. 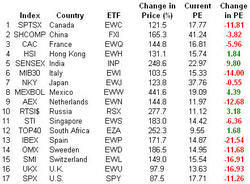 India has shown the largest increase in P/E, while China has remained atop the list. We found it interesting that despite large gains in Russia, South Africa and Mexico, their P/E ratios remain relatively low. Each country's major index is also listed with its iShares ETF, or another ETF if iShares does not provide one. Hi, Interesting post. Is this the original 2006 post or have you updated the PE ratios with 2007 numbers? Thank you. Hi, what source can we turn to for these PE ratios going-forward? Thanks! These returns and P/E ratios are updated as of the close on Friday, June 8th. JP: we will provide periodic updates for data like this. Although the Birinyi Mini Institutional service will provide much more detail. 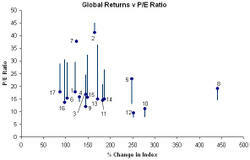 On the graph the furthest plotted PE ratio to the right labeled 10 should be labeled 8, that of Mexico. Would also like to see this with forward growth expectations factored in. Great work. Thanks for the informative posts. Are those trailing P/E ratios or forward P/E ratios? Based on the S&P 500 P/E ratio, I assume that they are trailing, but I just want to verify. How about adding Brazil's P/E in your next update? Thank you very much for the information that with your work offer us. Congratulations!